Well now, one winter it was so cold that all the geese flew backward and all the fish moved south and even the snow turned blue. Late at night, it got so frigid that all spoken words froze solid afore they could be heard. People had to wait until sunup to find out what folks were talking about the night before. Paul Bunyan went out walking in the woods one day during that Winter of the Blue Snow. He was knee-deep in blue snow when he heard a funny sound between a bleat and a snort. Looking down, he saw a teeny-tiny baby blue ox jest a hopping about in the snow and snorting with rage on account of he was too short to see over the drifts. Paul Bunyan laughed when he saw the spunky little critter and took the little blue mite home with him. He warmed the little ox up by the fire and the little fellow fluffed up and dried out, but he remained as blue as the snow that had stained him in the first place. So Paul named him Babe the Blue Ox. Well, any creature raised in Paul Bunyan’s camp tended to grow to massive proportions, and Babe was no exception. Folks that stared at him for five minutes could see him growing right before their eyes. He grew so big that 42 axe handles plus a plug of tobacco could fit between his eyes and it took a murder of crows a whole day to fly from one horn to the other. The laundryman used his horns to hang up all the camp laundry, which would dry lickety-split because of all the wind blowing around at that height. Paul and Babe in Bemidji, MN. I grew up in Northern Minnesota. 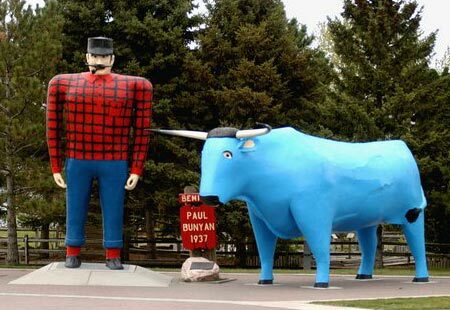 Among the taller of the tall tales told among those parts was the tale of Paul Bunyan and Babe, the Blue Ox. Babe the Blue Ox, Bunyan’s companion, was a massive creature with exceptional strength. It is known that Paul and Babe dug the Grand Canyon when he dragged his axe behind him. The formation of Great Lakes was centered around Babe: Paul Bunyan needed to create a watering hole large enough for Babe to drink from. There are also stories that Minnesota’s 10,000 lakes were formed by Paul and Babe’s footprints while they wandered blindly in a deep blizzard. To me, Babe the Blue Ox represents strength, hard work, loyalty, and friendship – all things I hope to see and accomplish by building a new fitness community here in the Teton Valley. That’s why The Blue Ox will be taking residence in the former Dreamchaser’s space this April. We will be offering fitness classes for the whole family, yoga and hot yoga, as well as CrossFit, and other fitness classes. We’re excited, and we hope you are too. If you’re looking to find a gym, Blue Ox is the place to visit!